Video visits are video chat conversations available at your facility lobby, from your personal computer and now, at select facilities, on the Visit Now Android app. 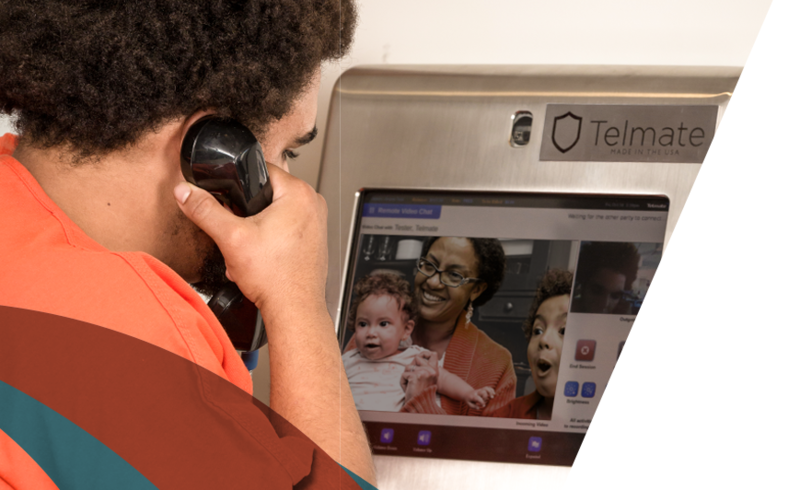 With video visits, our state-of-the-art system allows inmates, friends, family and loved ones to enjoy more personal, longer and more frequent visits. Our three video visit options offer onsite visits, and remote visits through your personal computer or Android device at select facilities. These visits are when you go to your facility and sit at a video visit station in the lobby. Your loved one or friend will be on a video visit station in their pod. A webcam and a microphone, or a computer with these components built in (most laptops have these built in). An internet browser. Internet browsers Safari 4 and higher, or Firefox 7 and higher, are strongly recommended. Using other browsers may not load the page appropriately in order to begin your visit. We are not responsible for technical problems or issues that may arise from using an unsupported browser. Adobe Flash MUST be installed. Just download the latest version here http://get.adobe.com/flashplayer/ to update your computer to the most current version for free. For the best visit experience you should use headphones, but they are not required. High speed internet (DSL or Cable) connection (dial up and satellite are not supported). Video visits go mobile with our Visit Now Android app. At select facilities families and friends can have video visits from their own Android devices. Once you have an account, setting up a video visit is a snap. Simply suggest a time for the visit with your loved one or friend, wait for them to confirm, and then log in at that time. It’s that simple. Whether you are at one of our custom video visit stations at your facility or in the comfort of your own home, we know you’ll enjoy this more intimate and personal way to connect. Free visits are a benefit for the inmate and are credited to the inmate’s account. Therefore the inmate is the only one who can book a free visit. This allows the inmate at your facility full control of whom they want to use their free visit with. There are also advanced scheduling rules that control the timeframe that a free visit can be booked. These rules vary by facility. If an inmate books a visit outside this timeframe, they will not be allowed to use a free visit. How can an inmate use their free visit? Book the visit with their Friends & Family. Suggest a visit with their Friends & Family. The Friends & Family must have no prepaid funds on their account at the time they confirm the suggested time. The inmate’s free visit will then be deducted. Confirm a suggested visit from their friends and family. The Friends & Family must have no prepaid funds on their account at the time the inmate confirms the visit. The inmate’s free visit will then be deducted from their free visit allowance. How can Friends & Family schedule a free visit? The only way Friends & Family can use a free visit is by suggesting a visit with the inmate. If the inmate has a free visit available and there are no prepaid funds on the Friends & Family account at the time the inmate confirms, the free visit will be deducted from inmate’s account. What Services Are Available At My Facility? PhonesYou need to create and fund an AdvancePay account, with ConnectNetwork to receive phone calls from your loved one. Video VisitationYou must register and fund your Video Visit account with ConnectNetwork to video visit with your loved one. Visit Now on DemandWith Visit Now, there's no scheduling needed, and you can visit from the GettingOut Visits Android app. TabletsYour inmate has access to tablets. Make a deposit to their account so they have more ways to be productive, and you have more ways to stay connected. * Currently available at select facilities. If you are asked to be Telmate Verified it means your facility requires verification of your identity prior to acceptance of inmates' calls. The purpose of verification is to ensure inmates are not connecting with inappropriate people on the outside. The verification process is simple and can be completed before or after creating an account. To be verified, you can make a deposit, schedule a visit or download and complete the Telmate Verified form. with friends and family, greatly reduce their risk of recidivism.